A backpacking hygiene kit for women takes a little thought, and a little time, but pays off big time in the back country. Taking care of your skin, hair, lips and nails while on a backpacking trip makes sense in terms of your personal comfort, but also for your health and well being. How to stay clean on a backpacking trip is a top priority! Let's put together a backpacking hygiene kit for women, step by step. To follow along, imagine a small zippered pouch (or heavy duty sealable plastic bag) that we will fill with the right personal hygiene products for female hikers. If you're like me, you have lots of large bottles of skin care products in the shower, on the bathroom counter, and in cupboards. Those aren't going to fly on a backpacking trip! 1. Buy small containers and fill them with your regular products. 2. Purchase travel size skin care products in sizes that make sense for personal hygiene while backpacking. To take the first approach, you will need reliable lightweight, easy open but stay closed, containers. I use these little guys called GoToobs and GoTubbs, which you can see in the picture above. The GoToobs hold 1.5 ounces (37 ml) each, and carry my face lotion, and foot/body lotion. The GoTubbs hold my daily vitamins and supplements, ibuprofen, and wedding ring (when I go for a swim, or know that I'll get my hands gritty) in a 2 inch by 2 inch footprint. They open with one hand - just a quick squeeze lets you get at the contents. If you buy a 3 pack, be sure they are all different colors so you can pull out the container you need from your hygiene kit at a glance. If you'd rather go the route of purchasing travel size skin care products, be sure you're not taking too much with you. Dump some out into a different (GoToob?) container! You don't need the extra weight, right? I find some of the travel size packaging to be too thick and very rigid, meaning it's hard to pack lots of things into my small backpacking hygiene kit. That's why I prefer the soft sided GoToob/GoTubb options for most personal care products. And here's a silly reason why I don't like to drag along travel size bottles: When I backpack, I go into Nature to get away from product advertising, marketing, and signs of human activity. Picking up a bottle of hand lotion with lots of marketing on it (New! Improved!) is jarring to me, and I'd rather have the simplicity of a container that is wordless. Simplicity in a backpacking hygiene kit for women goes beyond just the products, so call me crazy, but there it is!! I use a fragrance free hand and body lotion to lubricate my abraded skin at the end of every day. It makes a soothing bed time ritual, and gives my skin all night to absorb the moisturizers and emollients. And even though I'm scrupulous about using unscented products, they all go into the bear canister at the end of the day. Or a chew proof anti-rodent sack like this one. If you're facing an infestation of squirrels, mice and rodents, that sack can form the basis of a great backpacking hygiene kit for women! You might be surprised by how abraded and ripped up your skin gets while out on a backpacking trip. Nails and cuticles, both hands and feet, always seem to get ragged, too. Don't ignore hang nails, torn cuticles or jagged & dirty nails, because these create open highways into your bloodstream for the microbes you encounter on the trail. So bring along a lightweight nail clippers and a tiny little emery board (or a chunk of one you cut to fit into your hygiene kit). Again, roll in some personal care time just before bedtime as part of your nightly ritual. You'll be snug in your sleeping bag, with a full stomach and blissfully tired muscles, so this small little task is a great way to end the day. Women care about their hair, and taking care control of hair can be hair raising on a backpacking trip. clean enough to not drive you to distraction. This reality calls for a three-pronged approach to taking care of your hair while backpacking. And it requires specific things in a backpacking hygiene kit for women. First, you need clips, ties, holders, bandannas, scarves, hats and whatever else you've discovered works well to keep your sweaty hair from interfering with your vision and your comfort on the trail. Second, you need those same restraint devices for your hair as you filter your water, rehydrate and/or heat up your food, and clean up your cooking pots and utensils. Third, but what I find to be most important, you need a hair washing system that you can deploy every third day or so. How often you wash your hair is entirely up to you, but don't ignore those "gotta wash my hair" signals because they will subconsciously irritate you. Here's the system that works for me, with long, straight, fine hair. 1. Every morning I re-braid my hair as I check the map. If the day brings me lots of uphill, sweaty mileage I pin up my braid so it fits underneath my hat. Wear a hat with a non-velcro closure, to avoid the painful pulling that results when the short hairs at the neckline get caught. 2. When I'm done hiking for the day and it's time to set up my cook site, I want my hat off so I can see what I'm doing. But I don't want to fuss with my tangled, sweaty hair. That's when I pull out my Buff, and slide it up to create a head scarf. Not only does it hide my dirty hair and prevents food contamination, it helps keep the bugs at bay while I'm concentrating on preparing, or cleaning up, a meal. 3. I wash my hair every third day, weather and terrain permitting. Hair washing is harder than you might think in the back country. You will feel stiff and sore when bending way over to rinse your hair, if you've been hiking hard. And there are a few Leave No Trace rules to consider along with how to wash your hair. Carry water to your hair, don't bring your dirty hair to a water source. Use a collapsible basin like this one, or your water bottle. A basin will do triple duty for camp chores: washing dishes, watering a canine companion, and personal hygiene. A good scrub between each use will guarantee your good health. Use a soap that is biodegradable, but don't think that it won't affect a water source if you decide to ignore my advice and wash your hair in a stream or lake. This is especially true of cold mountain lakes, where the biodegrading process is very, very slow. I love Dr. Bronner's unscented natural soap because it doubles as my face wash, shampoo, and dish, sock and underwear washing soap. That means I devote just one GoToob (see above) or small plastic bottle to a multitude of cleaning chores. Pick a durable surface to absorb your wash water without drowning or disturbing fragile plants or animal habitat. Don't forget to have a towel handy. and a larger one for personal hygiene. These towels last and last, and I love how fast they dry. Use the loops to attach them to the outside of your pack as you hike along in the sunshine, and you're ready for the next round of cleaning! UV rays help eliminate microbial activity. They can be pressed into service when hiking through a bug swarm. Use them rolled up as a pillow, too, because of their softness. As a "pee rag", to eliminate the need to carry toilet paper. I highly recommend prolonged exposure to direct sunlight if you use this approach to female hiking hygiene. Tip: Use 2 different colors if you decide to bring 2 towels of the same size. I know it sounds like a small little thing to pay attention to, but it will streamline your wash up time and leave your brain free for more important things. And can you picture how frustrating it is to dig around in your pack and not find the "right" towel? You want your pee rag, or dish towel, separate from your bathing towel. If you have the luxury of a sunny spot to dry your hair, don't pass it up. Nothing feels as good after a day on the trail as imitating a lazy cat in the sun while your hair dries! A great way to dry your towels, too. If you're hiking through terrain with limited water, or you're too exhausted at day's end to heat up extra water for a wash up, these big Epic Wipe towels are for you! They're made of bamboo fibers and coated with biodegradable gentle cleansers. After you've used these towels for getting yourself clean, use them again for chores like wiping grit and mud off boots before entering your tent. When you're outside every day, your lips will dry out. That's when trouble can start. Cracked lips are an open invitation to soreness and blistering, if not infection. Lip balm is your friend, and not (only) because it tastes good. Make sure to carry lip balm in a handy pocket, and apply it frequently as you hike. This is especially true in windy or sunny conditions. Here's what I use, because it stays put and doesn't need frequent applications. It's also unscented, and safe for sensitive skin. The organic ingredients make me feel good about coating my lips with it. No weird or chalky tastes, either. I stash one in my backpack, and one in my hygiene kit. That way, I never have to dig around looking for lip balm. And in fact, the entire Badger line of skin and lip care products deserve a closer look as you're building a backpacking hygiene kit for women! When I know that sunny conditions will prevail on a backpacking trip, I also carry this lip balm, with SPF 18 protection. Again, all natural ingredients and a nice fruity taste, along with the UV protection. Note that it has a fragrance from the rosemary oil used to make it moisturizing. Keep this lip balm in your bear canister, out of your tent, when it's not being used on the trail. Tip: Make it a habit to check your pockets at the end of the day to be sure you haven't overlooked anything. And just for fun, read my review of a UV protective lip balm that tastes great. Unprotected exposure to ultraviolet rays can also trigger an outbreak of "cold sores", from a reactivation of a previous Herpes simplex infection. When the first glimmerings of an outbreak occur, take action. Lysine can shorten the duration of an outbreak. I carry this lip product and apply it "just in case". Or you can bring lysine tablets along in your GoTubbs (see above). NOTE: This is not medical advice! Do some background research for the validity of this approach, starting here. Another problem on a backpacking trip: canker sores (also called aphthous ulcers, but that sounds a lot more scary than these shallow mouth ulcers really are). These crop up when you're eating lots of sharp or acidic foods, or when your immune system is a little distracted by all of the trail dirt you're living in. Not much you can do to hurry along the healing, but good oral hygiene is really important when you have a canker sore. Also, depending on where in your mouth this painful little ulcer appears, your chewing routine will have to be adjusted. Don't stop eating, though! You need your nutritional status to remain high on a backpacking trip. Be sure you're getting your vitamin C to support your immunity. Oral hygiene is easy to let slip on a backpacking trip. But not if you're prepared! So be sure that along with the toothbrush, floss and toothpaste in a backpacking hygiene kit for women, you think about your lips and gums, too. Travel size supplies are easy to come by. Or use this especially fun coconut based kit. Over the years, I've gotten really good at predicting how much soap, lotion and personal care products I need on a backpacking trip. OK, to be really honest, I always overestimate how much I need each day to keep my skin from feeling greasy, my hair from becoming a disgusting tangle, and my teeth from feeling furry. 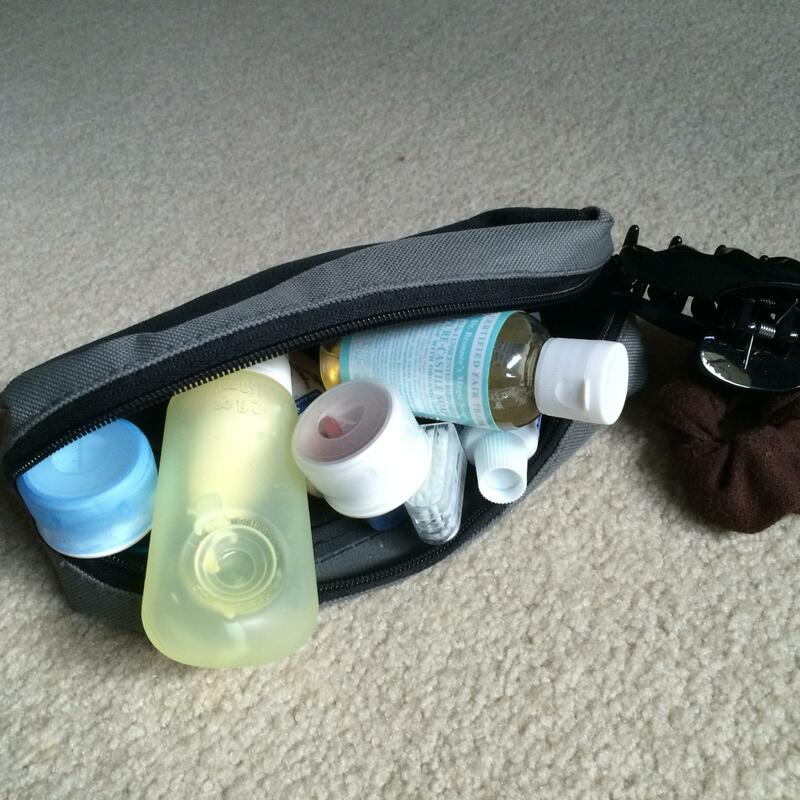 Fill up your little tubes and bottles with your personal care products, or gather together your travel size packages. And then use them for at least one week at home. Note that when you're really dirty or your skin really needs a good dose of lubrication, you will go a little heavier on your product usage. Anyway, it's a good way to estimate what you need to carry. Avoid them on a backpacking trip. 1. Animals are attracted to odors. Not so much your sweaty stinky socks, but definitely your soaps and lotions. Don't give them a reason to poke their noses into your backpack or tent. 2. Your fruity, musky, soapy fragrances give you away on the hiking trail. Try it some time: Try to smell hikers as they approach you and walk away from you. Old fashioned sweat is a natural odor to encounter on a hiking trail. So go fragrance free as you build the best backpacking hygiene kit for women hikers, and you can hike in stealth mode! Unless you're looking to attract a significant other. Then use your sweat to your advantage! What about poop, pee, and menstrual flow while backpacking? Those are very specific personal hygiene issues with body fluids, and deserve a lot of details. Go here to read them. A guy's backpacking hygiene kit will look a lot different than yours. Male hikers tend not to care about their hair, can grow a beard to cover up dirt, splash a little cold water on their faces and call it good in the morning, and happily wear the same crusty shirt for eight days in a row. focus on the outdoors and do the bare minimum to keep myself clean and presentable. All bets are off when I go solo! Kidding aside, it's important to have what you need to feel clean and comfortable, and to prevent skin, hair and nail issues from popping up. Maybe you still have questions about female hygiene while backpacking, and I'd be happy to answer them. Contact me, or use the Ask A Question link at the bottom left. We can fill up a backpacking hygiene kit for women hikers - either for yourself, or as a gift for a trail buddy - in no time at all. 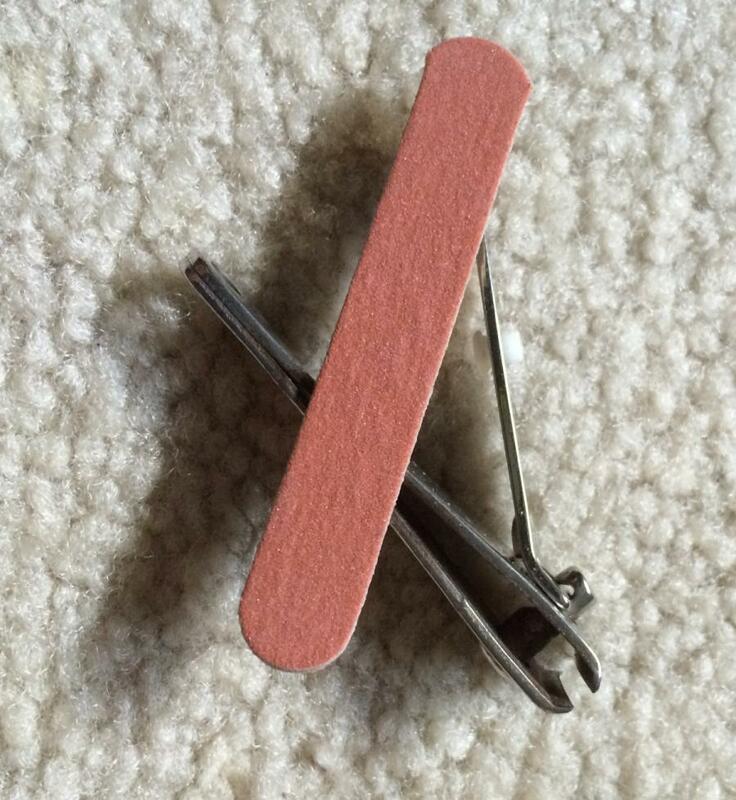 Or you can do it yourself, using these female hiker hygiene supplies! 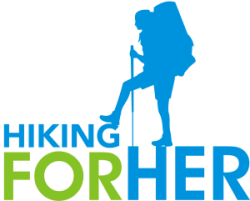 Some of the links on Hiking For Her are affiliate links, meaning a small percentage of your purchase price is received when you use the links on this website. You pay nothing extra to receive these trail vetted products. Thanks for your vote of confidence in the Hiking For Her backpacking hygiene kit for women recommendations!